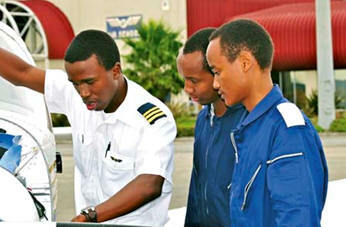 December 2, 2011 - Boeing is expanding its partnerships in Africa, announcing an agreement to jointly offer a comprehensive pilot training program with 43 Air School (Pty) Ltd., Africa's largest flight training organization. The agreement reflects a shared commitment by Boeing and 43 Air School to maintain and enhance aviation safety in Africa and around the world. Participants in the program will benefit from high-quality training at the "ab initio," or basic, level delivered by a world-class, experienced flight school and at the commercial jet level, delivered by Boeing. The three-phase program is designed to provide a candidate with no prior flying experience the opportunity to progress seamlessly through professional training to full competence and accreditation from basic instruction through jet training. Program graduates will be qualified as a Boeing Next-Generation 737 First Officer, ready to assume the right seat in the flight deck. "With three branches in South Africa, 43 Air School is Africa's premier flight school and with Boeing as a strategic partner, we can now compete globally, delivering world class aviation instruction rooted in international standards of training and safety," said Attie Niemann, chief executive officer, 43 Air School (Pty) Ltd.
"We have a unique understanding of this region's training needs, giving our customers a competitive advantage that cannot be matched on the continent. We're the perfect fit to partner with Boeing in delivering the 'Street to Right Seat' program." Phase One of the program will take cadets through basic flight instruction at 43 Air School. Phases Two and Three continue with Boeing Flight Services Jet Bridge and Type Rating programs completed at any Boeing training campus around the world. "Boeing is working to provide expanded access to flight training solutions in all regions of the world, enabling airlines to reduce their overall training costs as well as help meet the increased demand for pilots," said Roei Ganzarski, chief customer officer, Boeing Flight Services. "Over the next 20 years there is a global need for hundreds of thousands of new airline pilots. Through partnerships like this we're working to expand the pool of pilots from which airlines can select." Upon completion of training, graduates will have earned a private pilot license, with multi-engine and instrument ratings and commercial/multi-engine qualification and a type rating in a Next-Generation 737 or other models, as the market requires. "Boeing is one of the largest aerospace companies operating in the region, partnering with commercial aerospace suppliers Aerosud Aviation PTY Ltd., and Denel Aerospace. The addition of 43 Air School to the Boeing portfolio of partners is a further investment in supporting Africa's leadership in the aviation industry," said J. Miguel Santos, director, International Sales for Boeing Commercial Airplanes. "Flight crew training is going to be a critical focus in Africa as we seek to provide the necessary human resources to operate airline fleets to meet the region's market demands." Boeing offers the industry's broadest range of aviation services, including Flight Services aligned with customers' flight operations function. These offerings drive optimized performance, efficiency and safety through advanced flight and maintenance training ? including a network of 19 training campuses on six continents - as well as improved air traffic management and 24/7 flight operations support. Flight Services provides digital tools and data to enhance overall operations, airport infrastructure, fuel efficiency, flight planning, navigation and scheduling.